In all honesty, we are getting a discount for this post. HOWEVER it is all true. We’re not evil. But we like saving money, and we like saving time. CoSchedule has been the best use of both of them, thus far. We’ve been through approximately 4 different services to help organize content and editorial calendars (from Buffer to Google Docs, to misc one-off trials), but over the last two months, our experience with CoSchedule has been delightful. For us and for our clients. As a small digital marketing agency, being on top of everything is a constant battle. CoSchedule allows us to keep track of deadlines and collaborate in a real-time, visual way, making it super simple to manage outgoing content and wrap up projects. Planning, planning, planning. There is no better way to be prepared for any curve balls that may be thrown your direction than to plan extensively. By placing blog, newsletter, or social media posts or ideas into the content calendar days and weeks ahead of time, we are able to make sure that content is always on the books. Draft, publish, repeat. CoSchedule makes it insanely easy to start a fresh draft of content, make edits on the fly, and even add images through the interface. With all of the right integrations with WordPress, you can quickly add a new draft, go through the proofing process with your team, and publish and share to social channels from one page online. Collaboration is key. Awesome collaboration is one of the main ingredients to a successful team. CoSchedule’s interface allows you follow and contribute to a thread of comments on each piece of content, as well as adding tasks to specific people on the team, so everyone knows what is expected and communication isn’t lost in any random email thread. Managing multiple clients. Agency life means multiple editorial calendars for multiple clients, but luckily CoSchedule has dramatically smoothed this process. With its master dashboard, it only takes a click or two to get from one clients’ calendar to another, and back again without skipping a beat. – Layout – CoSchedule’s web interface is super simple to follow and find what we need, when we need it. We are constantly having to jump around from one client to another, and the side dashboard makes that a seamless process. Looking for something quickly in a certain calendar? The search box at the top of each page is amazing when you need to pull something up in a pinch, and you can hover over each piece of content in the calendar to view more details instantly. – Drag & Drop – Dragging and dropping is all the rage. 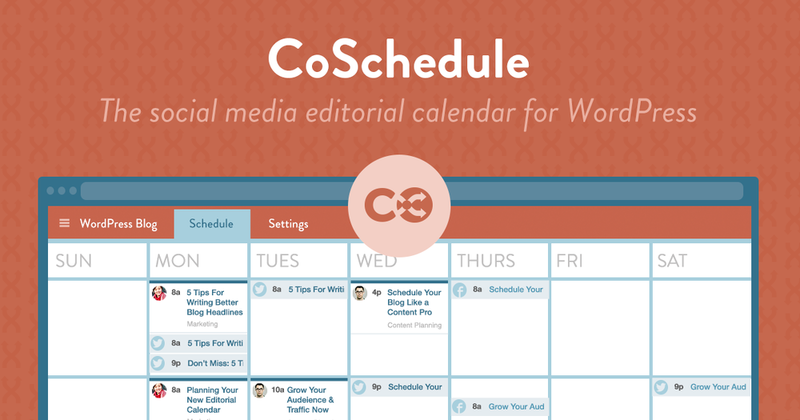 We can’t get enough, and CoSchedule nailed it. This functionality makes it possible for us to come up and add new content ideas to the calendar or tasks for team members, then easily drag and drop wherever it’s needed. By having that visual aspect of content management, it’s much easier to strategize and organize. – Integrations – You’ll get the most out of CoSchedule by connecting social profiles in addition to your blog in WordPress.Schedule and share to Facebook, Twitter, LinkedIn, and many other social channels. You can draft social content based on past content in WordPress, and view how each post will appear on each respective channel, so you can make certain the look and feel of every tweet and pin is up to par. – People – Having the right people filled in where they need to be can be a struggle, especially when managing multiple profiles and clients. This makes having the ability to add people as followers to specific calendars, pieces of content, and task things out accordingly, a MAJOR plus. We can’t stress enough how important it is to keep all relevant folks in the loop. – Task Reminders – We all forget things every now and again, but CoSchedule makes it just a little bit less riddled with anxiety. By utilizing the task system in each piece of content on the calendar, every person involved will have automated reminders sent to their inbox when a due date is coming up. Go ahead and take a free trial for yourself. See why we’re swimming in the Kool-Aid and join us on our praise-train for CoSchedule. CLICK HERE AND THANK US LATER. We’ve all come across a post or five in our newsfeed that so blatantly does not deserve a “like.” Whether it be offensive, sorrowful, in poor taste, or against our own views and beliefs, the simple choice to “like” or to “not like” an update or piece of content has never quite been enough. Facebook CEO Mark Zuckerberg has had a longstanding history of disliking the thought of a “dislike” button, while hundreds of thousands have signed petitions and joined support groups in favor. Who knew people wanted a way to express more than one kind of emotion online? While Zuckerberg has also stated that the new feature is rolling out to help people express truer empathy, and to sympathize with friends and family, marketers and businesses should stay in-the-know, and are looking at things from a slightly different perspective. The introduction of an alternative to the “like” could be setting the stage for a system of up-voting and down-voting content, but that isn’t necessarily a bad thing. Having information about how consumers are really feeling, both positively and negatively, can help marketers deliver ultra-targeted advertising and content. On the other hand, giving consumers the option to so visibly show disapproval and rejection could hurt more than help. Beyond the emotional data collection, providing more engagement options could also be an opportunity for Facebook to earn more in the long-term. Will they start charging brands and marketers additional fees to not allow these options? Could competitors charge through your content with “dislikes” to impact your data? No one knows yet for certain what these alternatives to the “like” will be, or how exactly they’ll function, but the new concept should be at the top of every marketers’ list. The new engagement buttons will start testing soon. We have a ton of questions, and we’re super curious to see what happens next. After years of logo tweaks so subtle that only the most hawk-eyed graphic designer and UX gurus would notice, Google has seriously changed its logo. As expected, the logo change has the internet abuzz with hot takes, praise, criticism, analysis and of course trolling. We hesitate to truly call it a “re-brand”, but with the larger moves afoot (in particular, their big Alphabet announcement), it is making waves in the marketing and design communities. We collected a few qualified opinions on the new logo, which we’ve listed below. Or you can just watch Google’s own video of how its brand has evolved in its 17 years of ranking everything. Straight from the search engine’s mouth. A short, relatively impartial overview of the changes. Another, fairly factual overview. This one includes pictures of Google’s design team’s process. Dives into the new, more dynamic nature of how Google plans on using its new brand identity. http://www.oliverandsons.com/wp-content/uploads/2015/09/Untitled-design-8.png 400 790 admin http://www.oliverandsons.com/wp-content/uploads/2017/03/logo.png admin2015-09-03 00:49:162017-11-09 17:24:52Who's Saying What: Google "Re-Brand"